Find out everything you didn't know about the most famous spaceship in the universe. While the Enterprise for Star Trek: The Original Series is iconic, the reality is that most people grew up watching the Next Generation. It's the ship that everyone knows and everyone loves, but here are some fast facts about the U.S.S. Enterprise NCC-1701-D you may not know. This was originally supposed to be a review of Star Trek: The Official Starships Collection which was sent to us by Eagle Moss Collections and was released in the U.S. last week. It's a beautiful series and comes with wonderful models that display perfectly. 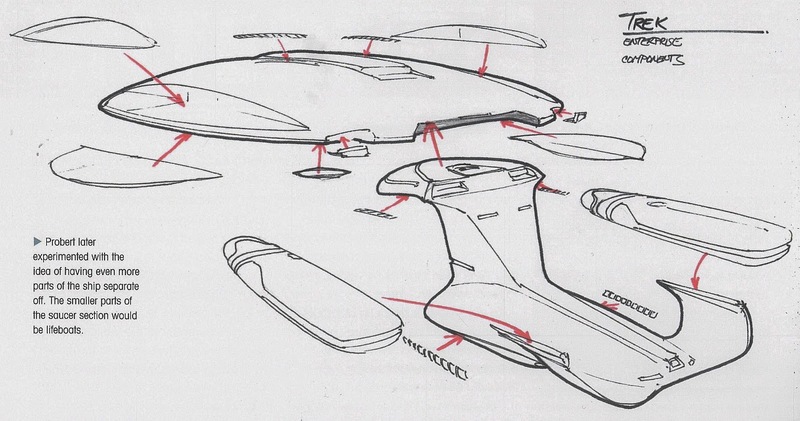 There's a fascinating article on the concept design of the Enterprise and many other well-written articles. Unfortunately, I discovered the articles have a small number of incorrect facts like saying there were two four-foot physical models of the Enterprise. Even the awesome die-cast model is the wrong color, looking tan instead of gray or blue-gray. While I can recommend it for the casual fan, for nitpickers, it's lacking. You can learn more about the collection by going to http://www.startrek-starships.com. Here are some things I learned from the book and other sources. 1. The U.S.S. Enterprise (NCC-1701-D) is a Galaxy-class ship and the fifth Federation starship in the Star Trek universe to carry the name Enterprise. 2. 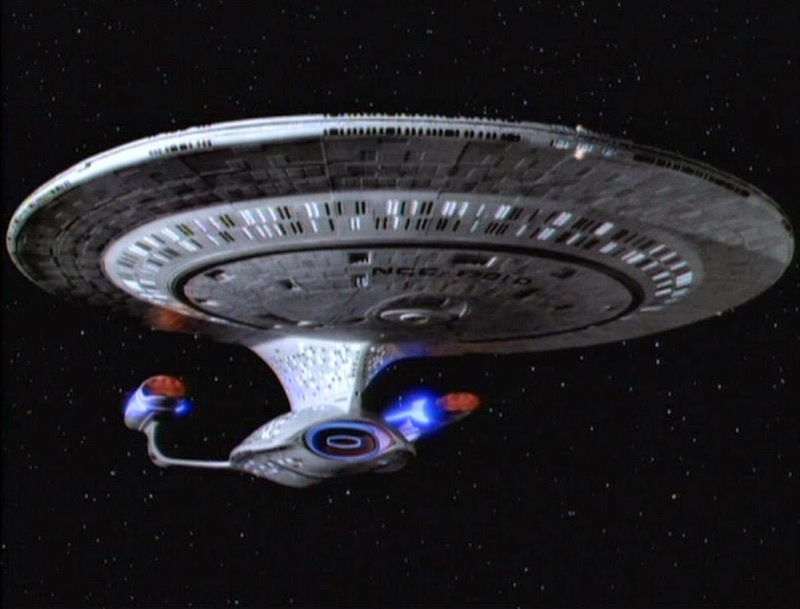 In the episode "Encounter at Farpoint", it was the first new Star Trek ship to appear on television in 20 years. 3. 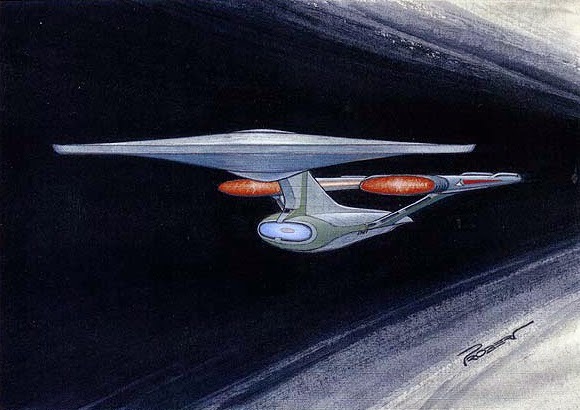 While working on Star Trek: The Motion Picture, concept artist Andrew Probert made a personal painting of what he thought the U.S.S. Enterprise would look like in the far future. He was working on the bridge for Star Trek: The Next Generation and put it up for inspiration. Producer David Gerrold borrowed it for a meeting and it was immediately approved for the new Enterprise. 4. 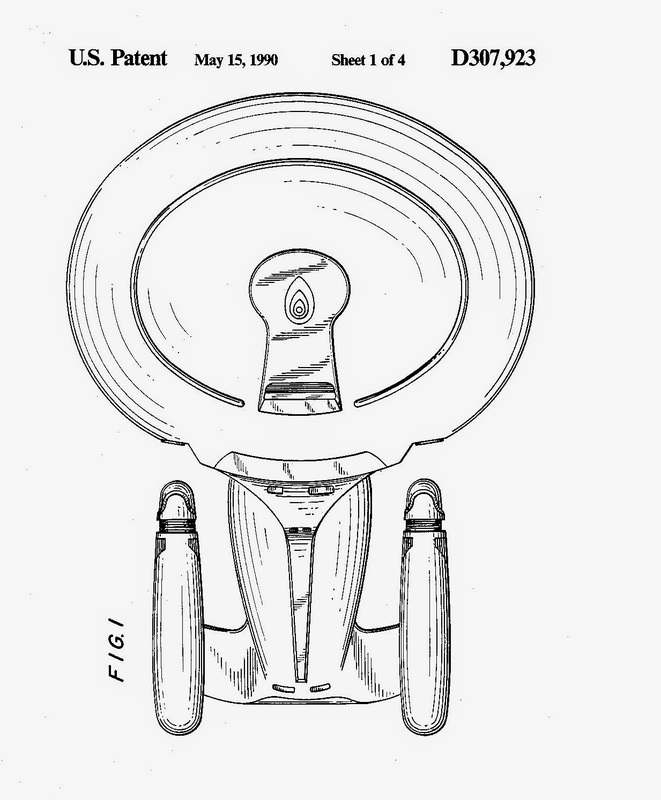 In 1990, Probert received a patent on the Enterprise-D design. 5. The warp nacelles for NCC-1701-D were originally designed to be much smaller than the original Enterprise since technology had advanced, but creator Gene Roddenberry felt the ship looked "underpowered" so he said, "Make the engines a little bit longer." 6. While the original U.S.S. 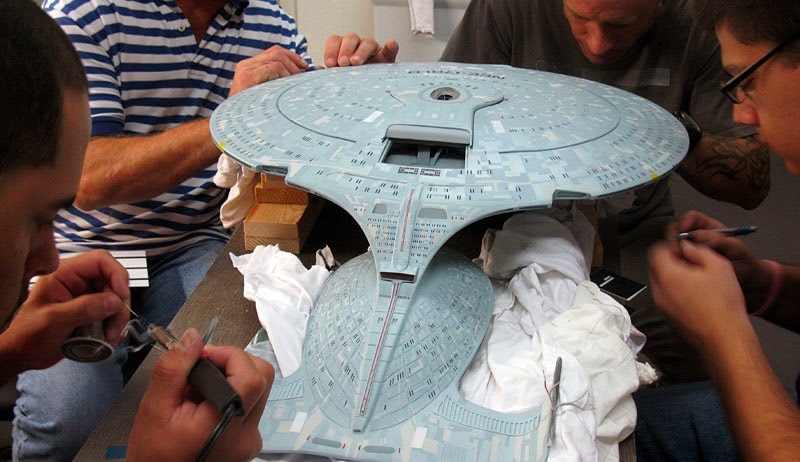 Enterprise was capable of splitting the saucer section from the main body, it wasn't until the design of the Enterprise-D was nearly complete that the producers told Probert that the ship would split into two parts. He had to redesign the ship to do it. 7. At one point the ship was designed to split into as many as 14 parts. 8. 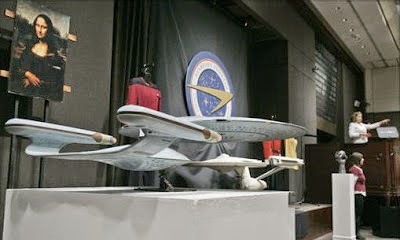 There were three physical models of the NCC-1701-D used on the show: a six-foot model, a two-foot model, and a four-foot model. 9. An original shooting miniature of the U.S.S. Enterprise-D was sold at auction for an expected price of $20,000 to $30,000. It sold for almost $600,000. 10. 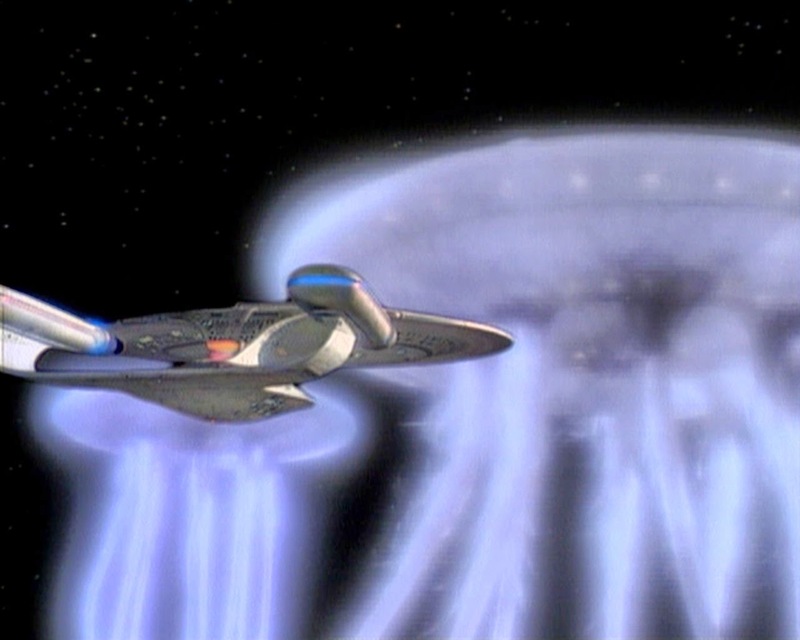 Originally, the show was supposed to reuse visual FX footage of the Enterprise-D similar to what was done in the original series. However, the use of video technology instead of film was so fast and cheap that more effects shots were created. 11. The ship was 1521.42' (463.73 m) long.That's more than four football fields long and twice the size of Kirk's ship. 11. The ship in the original series was gray but looked blue because of filming. The new Enterprise had a blue-grey colored pattern but looked gray on TV. 12. The ship was supposed to be so advanced that the engines would never malfunction. But a chief engineer was added because engine malfunctions were useful for the writers. 13. In the opening credits, you can see someone walking past the windows in the Enterprise. It's Captain Picard. 14. The Escape Pods (or "autonomous survival and recovery vehicles") on the ship could sustain four occupants for 86 days. 15. 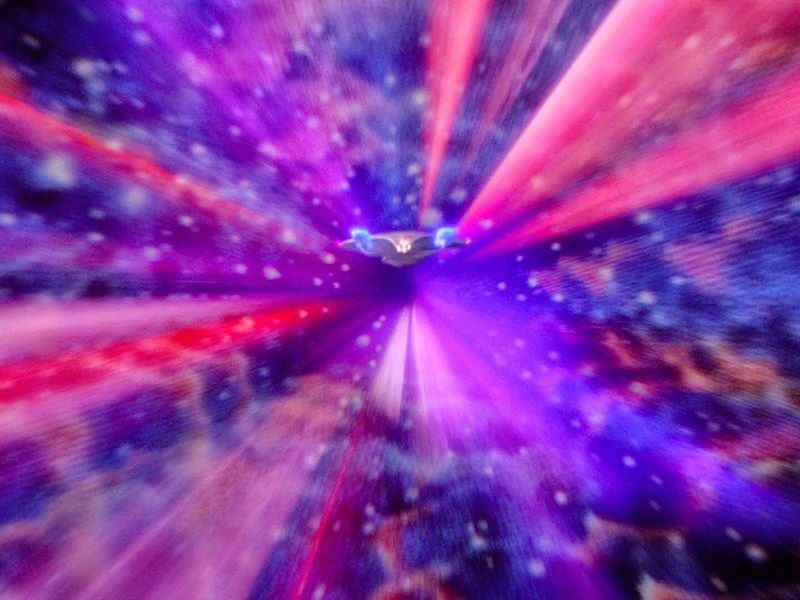 In the episode "Where No Man Has Gone Before" it's said the ship was traveling faster than Warp 10 which meant that it occupied literally every point in the universe. Later it was explained that the ship was actually at Warp 9.99999. 16. The Enterprise-D weighs about 400,000 metric tons which are more than the 700,000 1,500,000 elephants. Updated: The accepted weight (displacement) of the Enterprise is closer to 4,500,000 metric tons. 16. 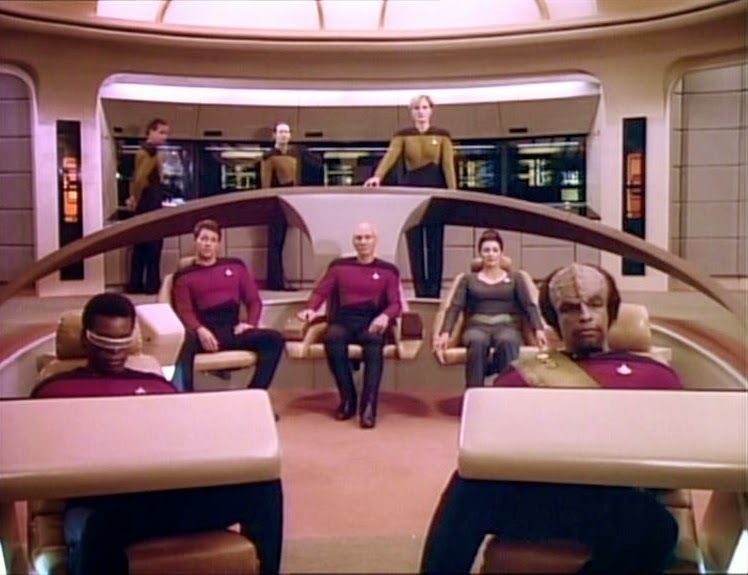 The ship had only one commanding officer, Captain Jean-Luc Picard, with the exception of brief commands by Captain Jellico and Commander Riker. 18. The Captain's Yacht was named Calypso, after the research vessel of the French explorer Jacques Cousteau. It was on the bottom of the saucer section and never seen in the series. 19. The U.S.S. 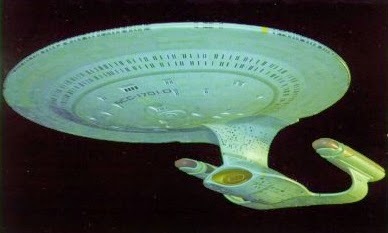 Enterprise NCC 1701-D has made an appearance in every two spin-off shows from The Next Generation (Deep Space 9 and Enterprise) and several movies. 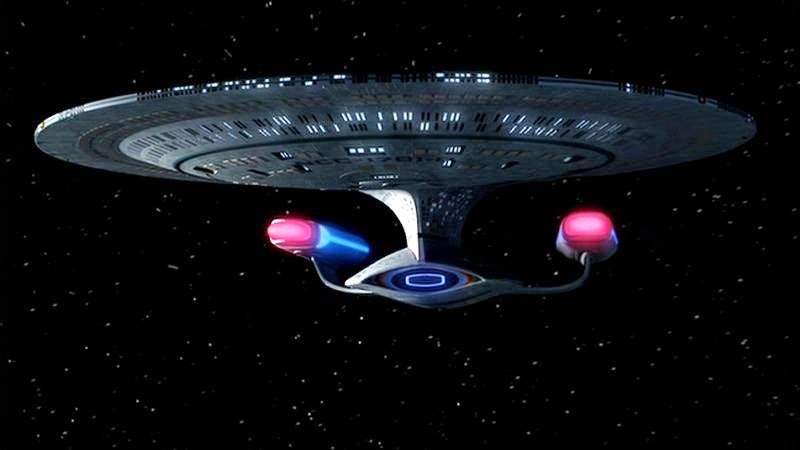 It's appeared in more episodes of Star Trek than any other ship, including the original series. 20. The ship could hold 1,014 crew members and up to 15,000 in an emergency. That's the same capacity as Chicago Stadium. 21. It's the only Federation starship to become sentient and have a baby. 22. 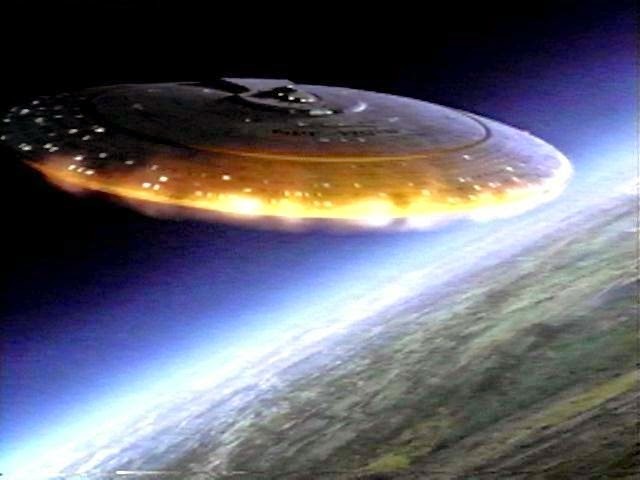 The idea of crash-landing the saucer section came from an illustration in the Star Trek: The Next Generation Writers' Technical Manual. They had planned to have the crash happen in the season six finale episode "Descent," but it was too expensive. 23. 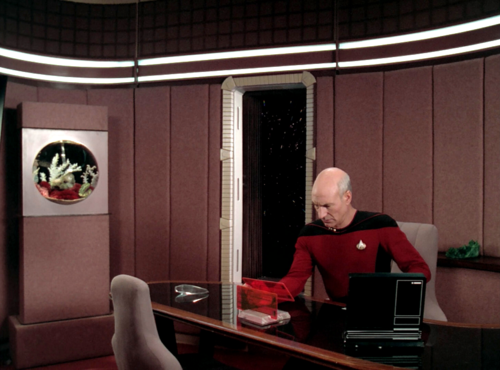 The fish in Captain Picard's Ready Room was named "Livingston" after producer-director David Livingston. 24. 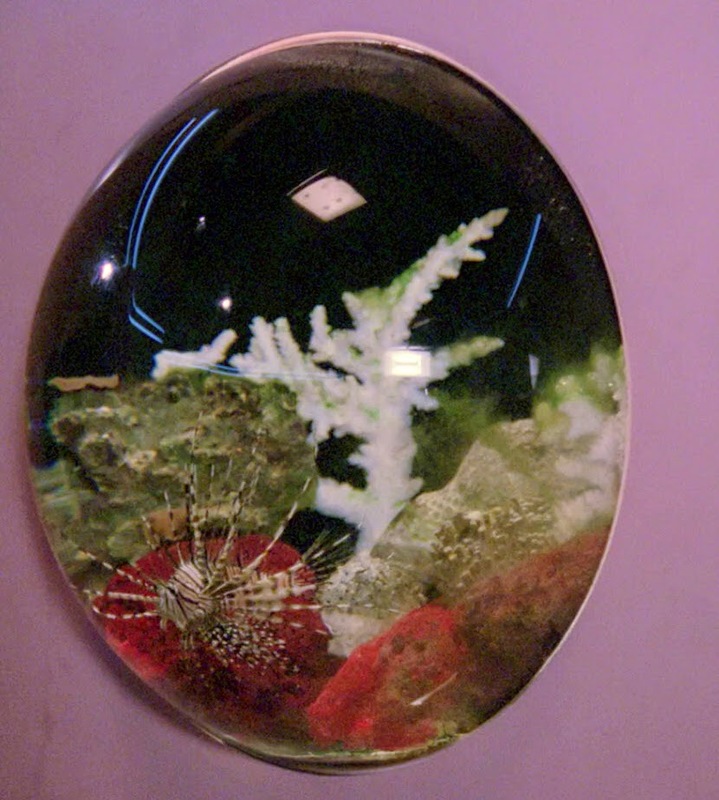 Patrick Stewart repeatedly petitioned to have the fish taken out because he felt fish tanks were inhumane. 25. Producer Rick Burman wanted to avoid making the ship look like the Original Series. He banned the color purple. Did you learn anything new about the Enterprise-D? 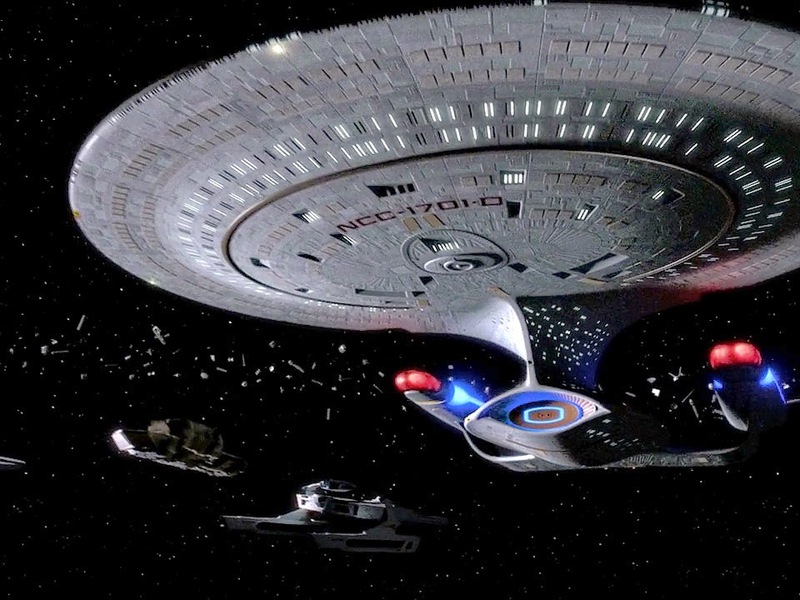 Which is your favorite starship from Star Trek? That's a lot of elephants. Longer engines - make it so!! Engine malfunctions were useful to the writers because the writers are lazy. I am bummed they never used the captain's yacht, though I think they used the one on the Enterprise-E in Insurrection. I'm still not sure what the point of it was. Couldn't the captain commandeer a shuttle? He is the captain after all. WOW Enterprise overload! Great stuff!! Now I know what to name our next fish. Livingston would be perfect David! For a boy or a girl. I guess the idea would be that it's more luxurious than your average shuttlecraft Pat. It would have been very cool for Picard to have been stuck in one with Lwaxana. I got a fever! And the only prescription! Is more engines! Picard's definitely a blink and you miss it moment Alex. I'm not sure which season they started it in. I've never gotten over the saucer separation. I remember walking through the front door of my house as a teenager while my parents were watching that first episode just in time for the separation. Let's just say I did not have a positive reaction to it and walked right on through the room. It had a baby? What? Wow! I thought that might be Picard in that window - but if I remember, it's a tiny, far-off shot. And I always thought the fish was named after explore and missionary, David Livingstone - didn't know about the director. Cool facts! It takes strength of mind to captain all this 24th century technology and that honour definitely goes to Captain Jean Luc Picard. When was the Enterprise-D in Voyager? I was wondering that myself when I read it but it was in drydock in the Voyager episode "Relativity"
This was fascinating. And I don't recall the Enterprise ever becoming sentient and "giving birth." Had to look that one up, but I guess I missed that one! Hey I thought the same thing Tyrean. Now you know. And knowing is half the battle! It struck me as dumb, corny, and contrived all at once. Basically, "we need a wow moment for this first episode; let's have the ship separate!" I hate things like that. Even when I was a teenager, I hated things like that. Also, there's a whale in there someone. I doubt that ship was supposed to be the Enterprise, just another Galaxy-class ship under construction. The timelines just don't match up. Even if the registry is the same, it's likely that was just a VFX oversight and nothing more. A nod to The Next Generation, nothing more. Also, in 14 that's a picture of the escape pods from the Enterprise-E, from the film First Contact. Like the Captain's yacht we never saw the escape pods on the D get used. And to point 16, Riker got promoted to Captain of the Enterprise after Picard was taken by the Borg in The Best of Both Worlds part 2. I wouldn't be surprised if there were other captains in command at some point too, but I can't think of any. Foomandoonian I've decided to concede on that point. I've changed that statement to reflect that. Thanks for chiming in. You're obviously a knowledgeable fan. 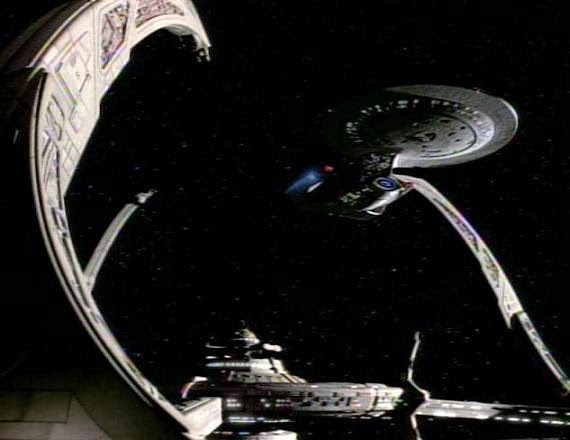 In the episode "Emergence" the Enterprise seemed to overcome various crises without any crew intervention. 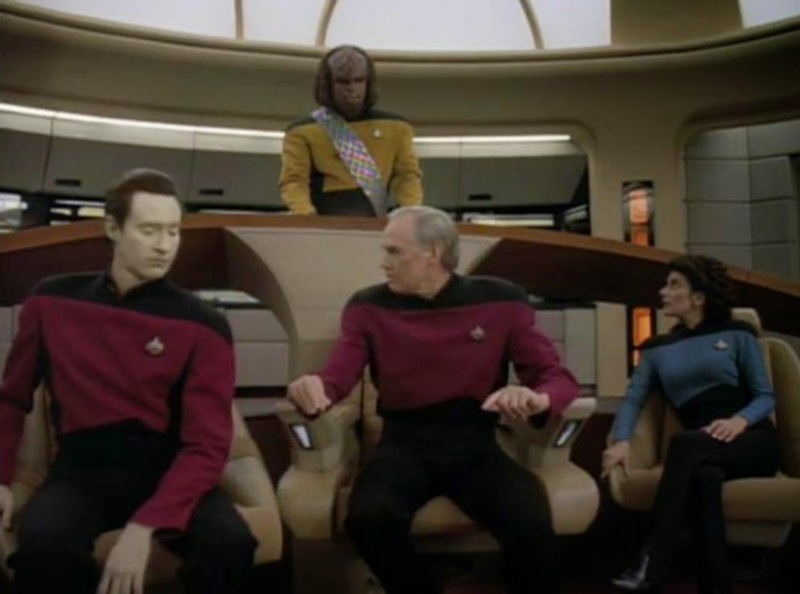 Data and LaForge investigate and discover strange interconnections in the ships systems forming a "brain" into the holodeck, prompting Picard to declare that the crew begin treating the Enterprise as a sentient being. Data manages to regain control of the Enterprise and aids her in her mission to "give birth" to a new sentient lifeform using vertiron radiation particles. 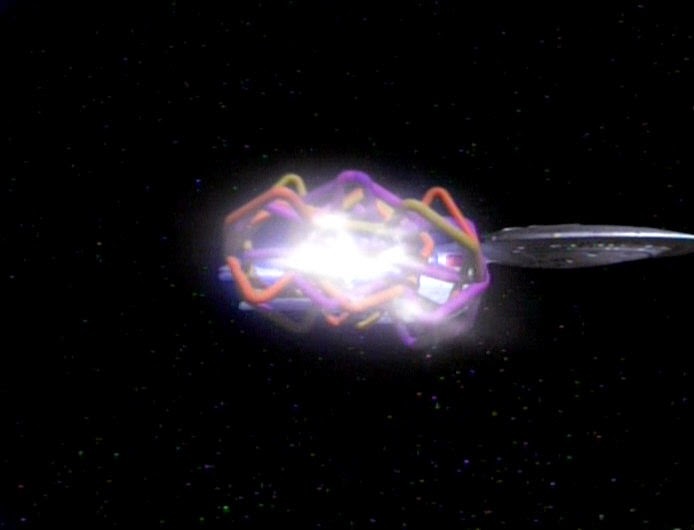 After the lifeform's "emergence" the Enterprise loses it's sentience. As it happens, I was reading that it was actually a sensor dome like on the original Enterprise. It was only when someone asked Patrick Stewart what it was he joked that it was the "Captain's Yacht" and it stuck ever since, even entering the TNG Technical Manual. It was more comfortable than a shuttlecraft and designed for extended missions not needing the Enterprise. Once DS9 came about and the writers introduced the Danube-class Runabouts, the idea of the Captain's Yacht was largely made redundant... at least until Star Trek: Insurrection but then it was more a case of "I think it's about time we took a look at the Captain's Yacht. We have one, we might as well use it just to show the audience we have one!" Sorry,... but the Captain's Yacht was Designed as a private or diplomatic shuttle for the Captain or assigned ambassadors. It is similar to a 'Captain's Gig' or 'Admiral's Barge', in today's Navy. This 'special' shuttle was in place, as such, at the beginning. The sensor domes (top & bottom) were redesigned as a kind of surrounding series of sensors, encircling the bridge (top) and yacht (bottom). Oh yeah, that does line up pretty well! I wonder if it actually is a canonical appearance then? Nice thinking. ~1500 inches aye? Doesn't quite equal ~450 meters. Kindof a tiny ship if you put it that way. Surely you meant feet. 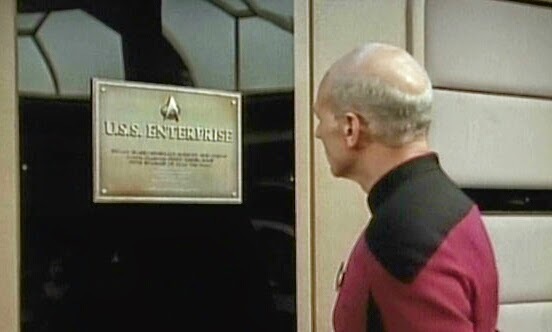 It was also the 6th, not the 5th, Federation ship to be named Enterprise. You had NX-01, NCC-1701, 1701-A, 1701-B, 1701-C, then this, the NCC-1701-D.
NX-01 served and was retired before the Federation was founded - they worked her hard during her 10 years in service. The Captain's yacht is seen in Season 6 Episode 25: Timescape. They are traveling in the captain's yacht. Why did you not say anything about the Primary Shuttle bay? which is never shown due to supposed massive size and small budget. 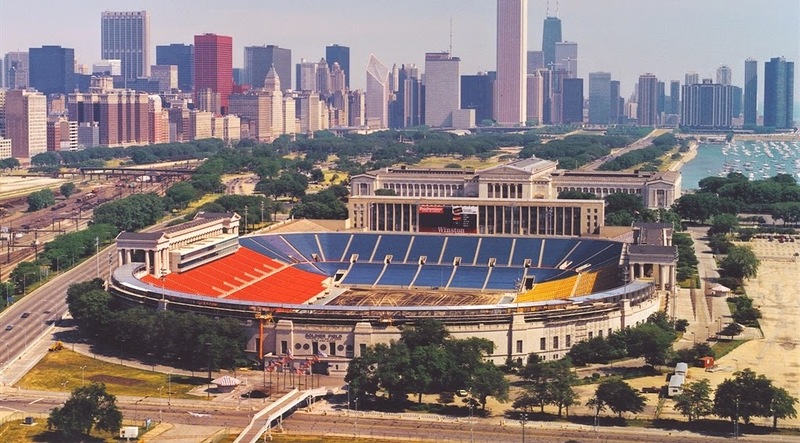 That picture is of Soldier Field (Football) which holds over 60k. Chicago Stadium was a basketball stadium. You got the mass wrong. The E-D masses either 4.5 million or 5 million metric tons. 4.5 is the commonly accepted number. 5 is given on screen on a data readout. The TNG Tech manual (written by production staff) has it a 4.96 million. "11. The ship was 1521.42' (463.73 m) long.That's more than four football fields long and twice the size of Kirk's ship." The Enterprise-D is actually 2107 feet or (642.5 meters) long with a mass of 4,960,000 metric tons. PELICANEATSCAT, the ship in Timescape is NOT the captain's yacht. It is a Danube-class runabout. It is even called "the runabout" in the episode. Sorry,... but your 'facts': 3, 5, and 11 (the ship is actually 2,108 feet, OL), are wrong. A pretty good average, considering how many 'expert sources' there are out there.